Vietnam Agriculture Opportunities | Corr Analytics Inc.
New York, NY. 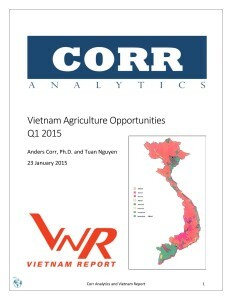 On 1/23/2015, Corr Analytics released the White Paper “Vietnam Agriculture Opportunities: 2015”, commissioned by Vietnam Report, a Vietnam-based company in the fields of corporate evaluation and rankings. Agriculture investors are increasingly looking towards Vietnam for investment opportunities. Vietnam has 10.3 million hectares of arable land, much of which is devoted to profitable export agriculture. Vietnam’s agricultural exports of approximately $30B per year account for about 20% of Vietnam’s total exports. Frontier investors also increasingly look towards Vietnam for opportunities. According to the Wall Street Journal, corporate sentiment towards Vietnam increased 1.98% between 2014 Q3 and 2014 Q4, and now Vietnam ranks #2, behind Nigeria, as the most-watched country by multinational investors. The biggest 2014 agricultural exports from Vietnam by monetary value were fishery products ($7.5B), wood ($5.8B), coffee ($3.4B), rice ($2.9B), cashew ($1.9B), rubber ($1.7B), fruits and vegetables ($1.4B), pepper ($1.2B), and manioc ($1.1B). The deals proposed to investors by Corr Analytics and Vietnam Report fit these major export markets, including companies that specialize in aquatic feed, livestock feed, rice, fertilizers, maize, cassava, firewood, coffee, rubber, seeds, seed plant, hogs, and hog breeding. The Trans-Pacific Partnership (TPP), currently under negotiation between the United States and 10 othercountries, will likely increase opportunities in Vietnamese export agriculture. According to a 2014 study by the United States Department of Agriculture, Vietnam should gain “modest agricultural trade growth potential” from implementation of the TPP. While coffee and rubber are not likely to gain international market share because they are already benefitting from current preferential trade agreements (PTAs), other Vietnamese exports will experience growth. Specifically, the TPP is likely to help export markets in rice, cassava, pepper, processed foods, and honey. Vietnamese meat, dairy, and fruit, growers, however, could feel greater competition from United States exports to Vietnam when the TPP is implemented.